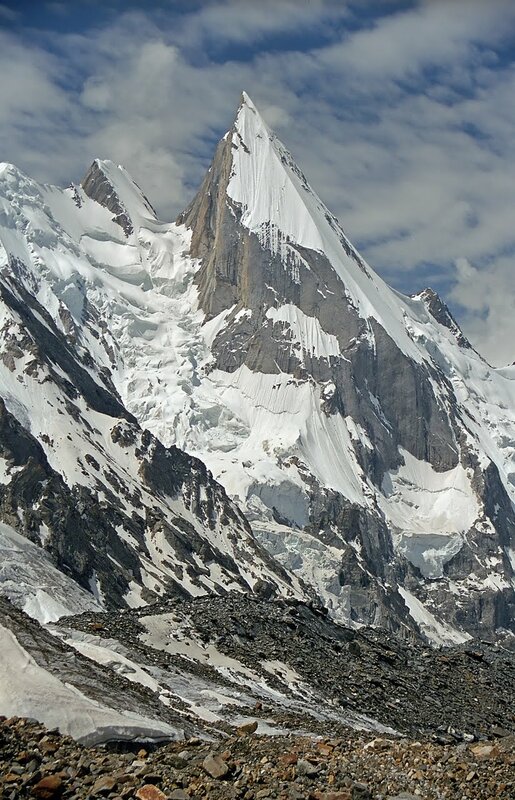 Laila Peak in Hushe Valley near Gondogoro glacier is in Karakoram range and is 6,096 metres (20,000 ft) high. It has a distinctive spear-like shape. Its northwest face has a slope of 45 degrees in more than 1500 vertical metres. The height of the Laila peak in Hushe Valley is controversial. Some believe it to be 6200 metres whereas some mention it as 6614 metres. In a Japanese mountaineering map by Tsuneo Miyamori (published in 2003), the height of Laila Peak is mentioned as 6096 metres. In the summer of 2005, the first ever ski attempts on Laila Peak were made by Fredrik Ericsson and Jörgen Aamot from Scandinavian countries. Although they could not reach the summit, they skied down the North-West face of the peak. They described it as "one of the most amazing mountains they have ever seen, like a needle it points straight up in the sky". Frederik and Jörgen reached the base camp of Laila Peak (4150 metres) on June 18, 2005, and they were at Camp1 (5000 metres) on June 22. They made their first attempt to summit on Friday, June 24. They started climbing from 5000 metres at 2:30 am and after seven hours of climbing when they were only 100 metres from the summit, they realized that it was too icy to continue, and started skiing down on the North-West face of Laila Peak towards Gondogoro Glacier. The mountain lies in a restricted zone. The village of Hushe is the gateway to the mountain, in the Masherbrum Valley below but the Gondogoro and Chogolisa valleys are restricted. In order for non Pakistani citizens to visit these valleys a permit must be purchased from the Ministry of Tourism ($50 per person), and a licensed guide is required for the duration.